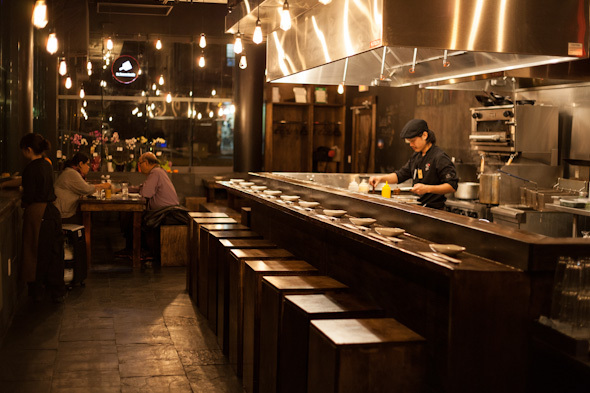 Teppan Kenta could almost go unnoticed amidst the grab bag of distractions over by Yonge and Wellesley. Running off an alleyway, the courtyard where this new teppanyaki grill house sits has the understated calm more befitting perhaps of the Yorkville hub to its north. Modesty, not pomp, however, defines this hidden bubble. Veterans of the izakaya circuit may wonder, justifiably, whether discretion or temperance, even in subtle doses, would blemish a Japanese bar's rep.
Not to be misunderstood, Teppan Kenta packs plenty of verve. On weekends, hullabaloo is on blast, if that's what you're after. But I wanted a little more alone time with their menu and to observe their cooking practices with a shrewd eye, so I opted to visit early in the week. Owner and chef, Kenta Taniguchi, was the former manager at Guu --pretty much the yard-chopstick for izakayas here in the city. While no radical revision, his new effort is no knockoff either. For starters, the intensity is turned down a notch, if only a smidge. 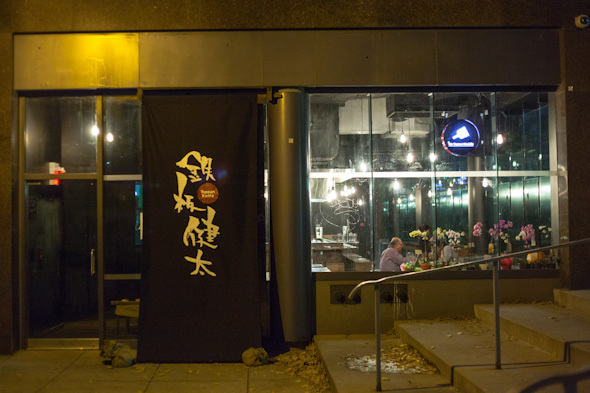 Reserved may be the wrong sticky to apply, but whereas mania ambushes you at Guu nonstop it seems, at Teppa Kenta the sense of welcome is as akin to Taniguchi inviting you over for a meal. Undoubtedly, the 14-seater bar pressed alongside the rink of the teppan griddle surely nurtures some intimacy and reduces the need for bombastic call and response. The Teppan-style fare is made for sharing. But be warned, some dishes are more filling than they sound. Get coached when you place your order. 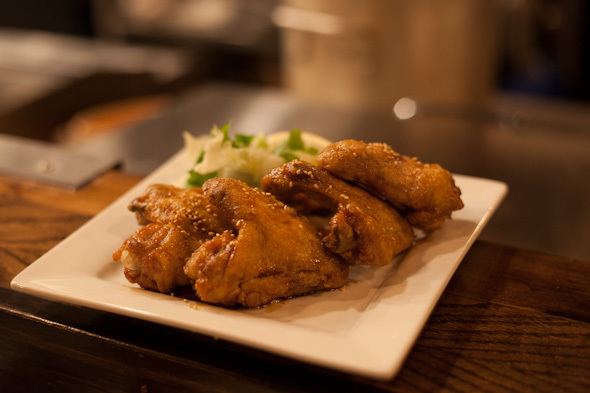 The tebasaki fried chicken wings ($6.50) were a delicious intro, glazed to a golden brown, speckled with sesame seeds, lemon zest as you like. Double-fried, the meat was tender and juicy inside, but had the right thin crisp of skin. Following the oily and savoury flavours of this dish, the dashimaki ($5.50) a seaweed omelette infused with a mild Japanese broth was bound to pale by comparison, being somewhat bland and watery, though quite the fluffy coil. 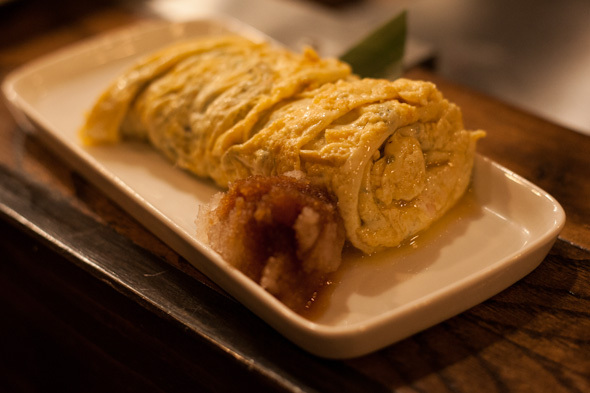 Thankfully, another egg-based dish, the omu soba meshi ($9), returned to rich, savoury tones. 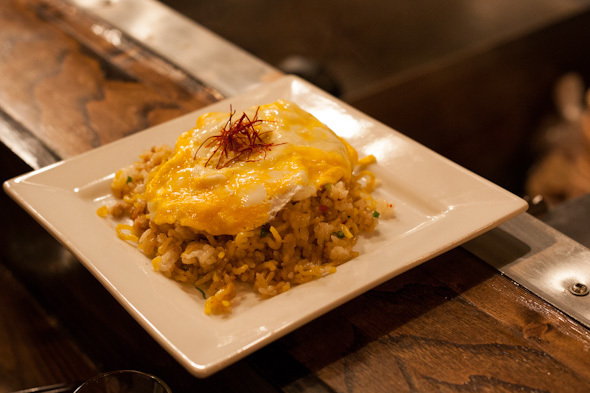 In this dish, fried noodle and rice were mashed together beneath an omelette, a broken and blushed bleed instead of fully mixed, with a crown of saffron laid into a mini nest. Crispy yet gooey in places where yolk had seeped through, it spurred on memories of a breakfast hash. 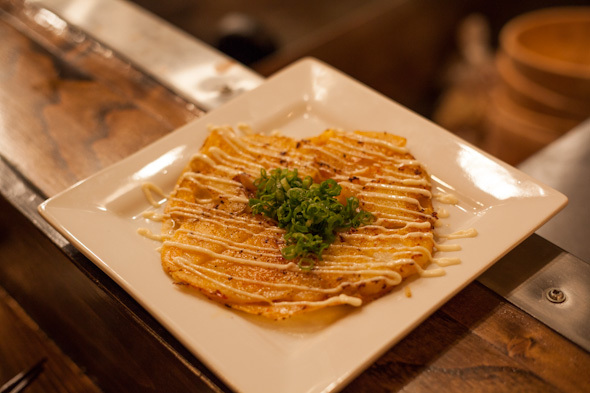 The highlight of the evening was their Hiroshima style okonomiyaki DX ($15, lead photo). Having spent a number of months in Hiroshima and Osaka, I managed to eat some permutation of the dish daily and haven't been able to fill that void here at home. As opposed to the hodgepodge mix of ingredients in the Osaka version, the Hiroshima take on the soul food staple scaffolds layers of sprouts, nagaimo yam, scallions, tempura crumble, and shredded cabbage in its batter, and contains pork belly slivers, squid, shrimp, and egg. Once griddled together, bonito flakes are sprinkled over the disc to cover. Behold as those bonito get down and shuffle like parking lot air dancers across the umami-tart surface of generously slicked okonomiyaki sauce. Definitely better than the version I've had at Guu, Teppan Kenta's just very might make top cut for some of the best authentic okonomiyaki offered as a regular menu item. Another delight is their chan-pote ($6) app: more pancake than the pizza they describe, wafer-thin chewy triangles of potato are topped with green onion and a thin wavy drizzle of house mayo. My only complaint was that the spicy pickled fish innards didn't really come through either in texture or flavour. One of Taniguchi's specialties, the ebi cheese dish ($7.50) was a bit of an odd duck. 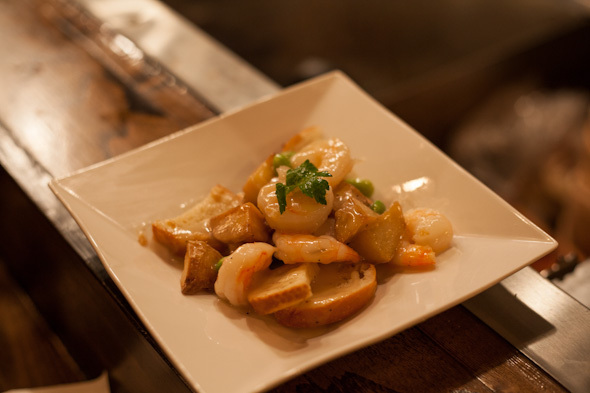 A melt of shrimp, fried potato and croutons, the cheese component was not as blatant as I expected. In fact, it was extremely subtle, mixed into the sauce in such a way that it reminded me of some Cantonese dishes I grew up on. 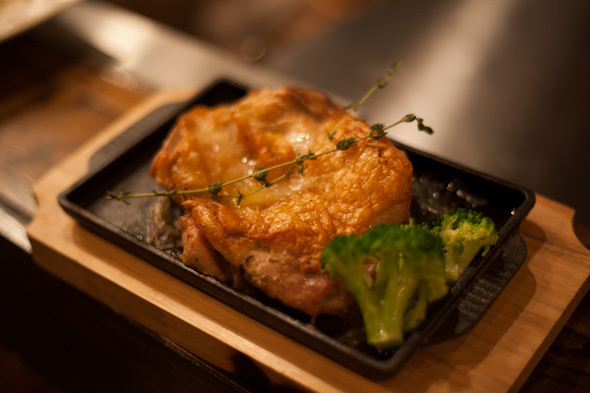 The skin-on, rosemary grilled chicken ($8) was absolutely delicious, and though perhaps a basic izakaya item, I would by no means feel provincial if I made a habit of it upon each visit. 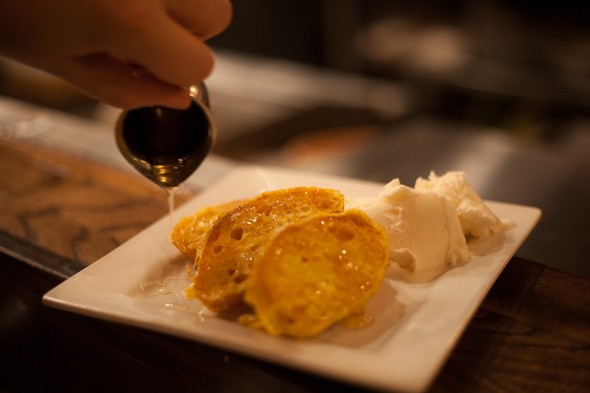 For the dessert send-off, the iron-griddled French toast ($5) was improbably satisfying given its total simplicity. Only the added coating of vanilla ice cream gave those eggy ovals of airy bread any gravity or a cue that it was time to stop eating.